- To start our recipe for making red velvet cake, grease two 7-inch baking tins with butter and dust with flour. Tap out the excess flour. Set aside. - In a large bowl, whip the butter until it has a creamy texture. Then add the castor sugar and vanilla essence. Beat until well combined. Next, add the eggs and beat again. - Add the flour, cocoa powder, baking soda and mix well. Add the food colouring and pour the batter into two greased tins. Bake for 25-30 minutes or bake it until a skewer inserted, comes out clean. Set the red velvet cake aside to cool. The red velvet cake is incomplete without its icing. In a large bowl, beat the hung curd lightly until it is creamy. Add the sugar, vanilla essence and mix well. Empty the icing into a piping bag and refrigerate. - Cut the bulging top crust to even out the red velvet cake. Flip them so that the cake is even and easier to ice. Pipe a layer of icing onto the first cake. - Place the other red velvet cake on top and press lightly. Pipe another layer of icing and spread evenly to fully cover the cake. - Decorate with toppings and serve! 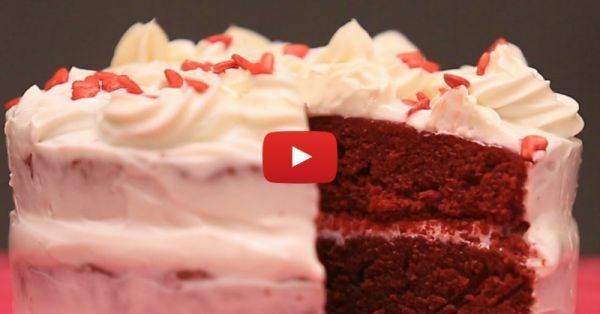 Now you do know how to make red velvet cake with this easy recipe. Don't forget to subscribe to POPxo Yum here.